In most countries, the strength properties of the concrete in a structure are assessed indirectly by measuring the strength of cubes or cylinders which are made in a standard manner from the concrete supplied to the site. Whilst this is well accepted by the industry, it has its limitations in that problems are not detected until it is too late as testing is generally carried out at 7 and 28 days. In addition, and fortunately infrequently, it can be the subject of abuse either by making cubes prior to the addition of more water to the mix or, in extreme cases, by the contractor supplying cubes from a specially prepared mix which will meet the specifications. Furthermore, cubes or cylinders manufactured in a standard manner do not represent the quality of concrete in the structure. One way of dealing with these issues is to measure the strength of cores or cubes cut from the structure. Not only this is quite a laborious procedure, but also is not possible in all cases and especially in slender members. More over it leaves behind part of the structure to be filled with an appropriate material. These shortcomings could be eliminated by measuring the properties of the concrete in situ. This also permits the effectiveness of the compaction and curing processes to be incorporated in providing a reliable indication of the condition of the finished product. Another advantage to be gained from in situ strength testing is that the speed of the overall construction programme could be increased if an accurate assessment of the in situ strength was made because this would allow a much faster .turn-around for formwork and back-propping. Two basic approaches can be used. One is where the metal disc is attached directly to the concrete surface. This approach is used to make an assessment of the strength of a body of concrete where there is no reason to believe that its surface is materially different to the rest of the mass. Typically, it might be used to judge when it is safe to strike formwork. The second approach is where partial coring of the surface is adopted. 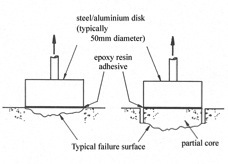 If the concrete surface is carbonated or altered and, therefore, having different physical properties compared with the interior, a much more valid strength value is obtained by coring to a depth below the affected layer thereby causing the failure surface to occur in the unaffected mass. This second approach has particular value in assessing and assuring the strength of the interface between base concrete and surface repair material. If the partial core is continued below the interface and the failure is on the interface, a direct measure of the bond strength of the interface is obtained. 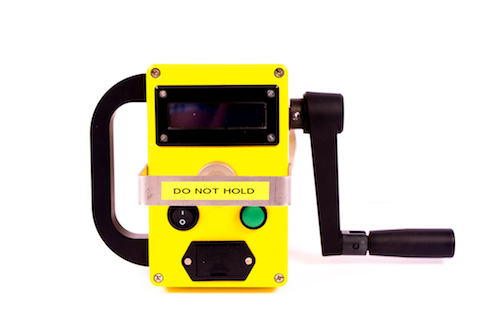 The Limpet is a simple, sturdy, lightweight, portable device to measure the strength of concrete and concrete repair materials on site or in the laboratory. The device is manually powered, precisely manufactured and has an accurate electronic load measuring sensor to record the concrete failure load. The Limpet is supplied in a portable carrying case and consists of a number of parts. The main body of the instrument contains the gear driving system and the tensile force measuring and recording system (Fig. 1a). 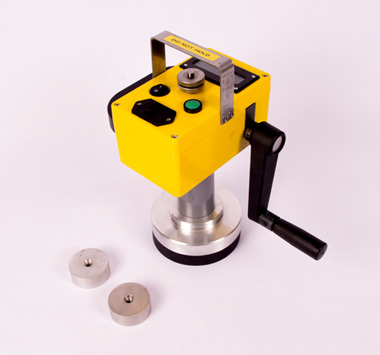 The steel loading rod which is anchored at the top to minimise eccentric loading is screwed into the loading disc in order to carry out the test. 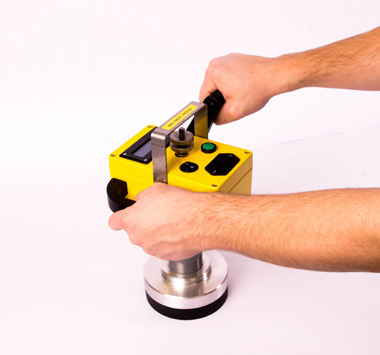 To ensure uniformity of loading with minimal eccentricity, the hard rubber base of the instrument rests firmly on the concrete surface during testing (Fig. 1b). In this figure, shown also is the disc that is used to carry out the pull-off test and that with concrete attached at the end of a test. Fig 1c shows display panel, switches, top of loading rod underneath safety strap and the battery compartment. •	Consistently accurate and reliable results can be achieved by an unskilled operator. •	An inspection of the fracture surface allows unsatisfactory failures to be instantly discounted and gives useful information on the quality of the concrete. •	Does not require planning in advance of placing the concrete. •	Provides a check on safety in relation to when shuttering can be stripped, shoring can be removed, prestress can be applied, or check in situ strength if cubes do not achieve the design strength. •	Low cost and speed of testing. •	Is very light, easy to handle and so is very suitable for site use, even overhead testing. To convert the pull off tensile strength into a cube compressive strength an empirical correlation chart, such as shown opposite, can be used. It is a fairly simple matter to produce a correlation chart for the specific aggregates and cement being used, thereby improving accuracy and consistency of testing. The LIMPET was originally developed to assess the strength of concrete on site. However, it is now a standardised test to determine the bond strength of patch repairs and this has become its principal application. The instrument can also be used to assess the progressive deterioration of concrete and other building materials due to their interactions with the exposure environment. Research carried out by the Structural Materials Research Team at Queen's has found good correlations between salt weathering of normal concrete and pull-off tensile strength. The test is considered to be partially destructive as it leaves a small mark on the test surface due to the removal of a small piece (50mm diameter) of the material being tested. However, this level of damage is considered to be acceptable given that the alternative is to remove cores from the structure and test them in a laboratory. The advantages of Limpet are many, which include the fact that no preplanning is required. It compliments the Autoclam Permeability tests because both the Limpet disc and Autoclam ring can be fixed to the test surface at close proximity to each other. This is a unique advantage when repair materials are assessed on site. 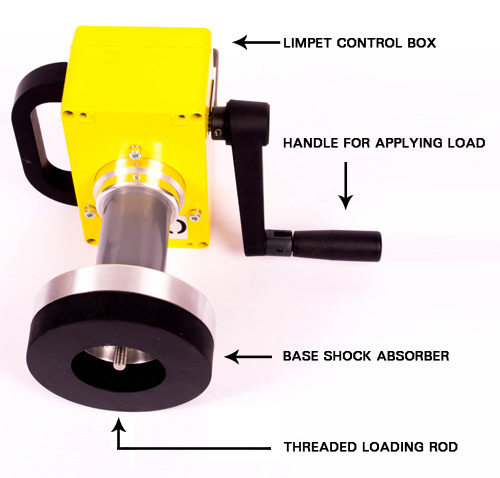 The Limpet pull off test has been developed by Queen’s University Belfast in partnership with Amphora NDT Ltd. Since its launch it has seen widespread use in both academic and industrial work all around the world. This section details some of the published work using the Limpet. A wide range of approaches are available for estimating the strength of in-situ concrete and these include indirect methods such as cube or cylinder testing, non-destructive methods and the more recently introduced partially destructive tests. 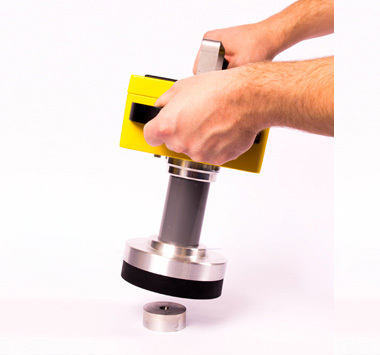 In the latter category the pull-off test involves bonding a circular steel probe to the concrete surface using an epoxy resin adhesive which is stronger than concrete in tension. By measuring the load required to cause a tensile failure in the concrete the equivalent compressive strength can be estimated by using an appropriate calibration graph. This paper summarises the results of tests carried out over the past nine years and includes a comparison with other partially destructive methods which are currently available. The results of field tests, carried out during the construction of a multi-storey parking garage, are reported as well as two case histories relating to commercial applications. In all instances the viability and accuracy of this in-situ test method have been proven. Repair to concrete structures often involves breaking out cracked concrete and replacing this and areas of spalling with a mortar or concrete. Adhesion of the new patch to the original concrete is generally considered to be an important criterion in judging the success of the repair. In recent years, the pull-off test method has gained favour as an in situ method of assessing the tensile adhesion strength. On the basis of an extensive programme of tests, this paper outlines the factors which affect the test and describes an appropriate scheme for acceptance testing of patch repairs. 2.1 Why assess the properties of near-surface concrete? The deterioration of concrete structures is a major problem in many countries throughout the world. This has prompted the search for methods of predicting the service life of both existing and new structures. Current prediction methods are still in their infancy and, before they can be used with confidence, more reliable information on the properties of the concrete in these structures will be required. In this paper a range of test methods for determining the strength and transport properties and the extent of corrosion are critically reviewed. Whilst all provide useful information the ability to measure the transport properties has been shown by many researchers to give the most reliable indication of the likely durability. In spite of this it is recommended that an holistic overview is adopted as no single test is sufficiently reliable at present. Using such an approach, durability-based design criteria can be developed for concrete and the remaining life of existing structures estimated. In 1974, the concept of using pull-off test as a means of predicting the compressive strength of concrete was patented in the UK by Professor Long at Queen's University Belfast. Initially, the pull-off test was developed primarily aiming at unplanned in-situ strength determination. It was found later also particularly suited for assessment of bond strength of repairs. This test has now been accepted in British Standards, BS 1881-207:1992 for assessing the in-situ concrete strength in structures and BS EN 1542:1999 for assessing the bond strength between overlays and substrate concrete in patch repairs. In addition, BS 1881-201:1986 recommends it for quality control and long-term monitoring of hardened concretes. It has also been accepted in North America (ASTM C1583-04), Holland and some other countries for similar applications. This paper reviews its development history, principle, factors affecting the test results as well as its current applications in civil engineering fields. Bai, Y., Basheer, P. A. M., Cleland, D. J., & Long, A. E. (2009). State-of-the-art applications of the pull-off test in civil engineering. International Journal of Structural Engineering, 1(1), 93-103. The development and maintenance of a sound band is an essential requirement of a concrete patch repair. Tensile bond tests are increasing in popularity as a means of measuring this adhesive property, both on site for quality control and in the laboratory for materials evaluation. This paper discusses the main issues relevant to tensile bond testing, namely material properties, surface conditions, geometry, loading and the effects of material mismatch. Analytical and experimental work is presented, along with the results of other researchers, with an emphasis on the core pull-off technique. The latter is shown to be a good method for evaluating bond strength provided that appropriate precautions are taken to minimize the influence of flaws and stress concentrations, and that the effects of mismatch in repair and substrate properties (particularly modulus, shrinkage and thermal expansion) are fully understood. This paper investigates the influence of three fundamentally different durability enhancing products, viz. microsilica, controlled permeability formwork and silane, on some of the physical properties of near surface concrete. Microsilica (silica fume) is a pozzolan, controlled permeability formwork (CPF) is used to provide a free draining surface to a concrete form, while silane is a surface treatment applied to hardened concrete to reduce the ingress of water. Comparisons are made between the products when used individually and used in conjunction with each other, with a view to assessing whether the use of combinations of products may be desirable to improve the durability of concrete in certain circumstances. The effect of these materials on various durability parameters, such as freeze-thaw deterioration, carbonation resistance and chloride ingress, is considered in terms of their effect on permeation properties and surface strength. The results indicated that a combination of silane and CPF produces concrete with very low air permeability and sorptivity values. 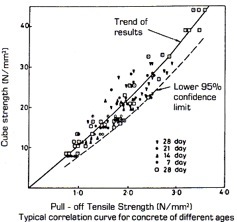 The influence of microsilica was more pronounced in increasing the surface strength of concrete. Fly ash (FA), furnace bottom ash (FBA) and Lytag (LG) were used in the current study to replace ordinary portland cement (OPC), natural sand (NS) and coarse aggregate (CA), respectively, and thereby to manufacture lightweight concrete (LWC). Two control mixes containing no replacement materials were designed with a 28-day compressive strength of 20 N/mm2 and 40 N/mm2. For each compressive strength, three different mixes, viz. (a) 100%OPC+100%NS + 100%CA, (b) 100%OPC + 100%FBA + 100%LG and (c) 70%OPC + 30%FA + 100%FBA + 100%LG, were manufactured with slump in the range of 30 ~ 60 mm. The density, compressive strength, pull-off surface tensile strength, air permeability, sorptivity and porosity of the concretes were investigated. The results indicated that it is possible to manufacture lightweight concrete with density in the range of 1560-1960 kg/m3 and 28-day compressive strength in the range of 20-40 N/mm2 with various waste materials from thermal power plants. However, the introduction of FBA into concrete would cause detrimental effect on the permeation properties of concrete. With part of OPC replaced with FA, the strength decreased, but the permeability of the resulting concrete improved. Marble which has the same surface roughness with aggregates was used to represent the coarse aggregate (cobblestone) in concrete. The specimens for tensile bond strength were made by casting mortar cylinder on the surface of the marble plane, and the pull-out tester was used to test the tensile bond strength between aggregate and mortar. The shear bond strength was evaluated from axial compression tests of the specimens containing an inclined interface between aggregate and mortar. By varying the inclination of the aggregates, the regression equations of the interface under bidirectional strained condition were established. The mechanical models of interface were used at meso-level and the failure process of concrete was simulated using the simulation system developed by the authors. It was shown that more reasonable results can be gained in the simulation by considering the bond strength of interface between aggregate and mortar. Wang, Z. L., Gu, X. L., & Lin, F. (2010, March). Experimental Study on Mechanical Performance of Interface between Mortar and Aggregate in Concrete. In Earth and Space 2010@ sEngineering, Science, Construction, and Operations in Challenging Environments. ASCE.